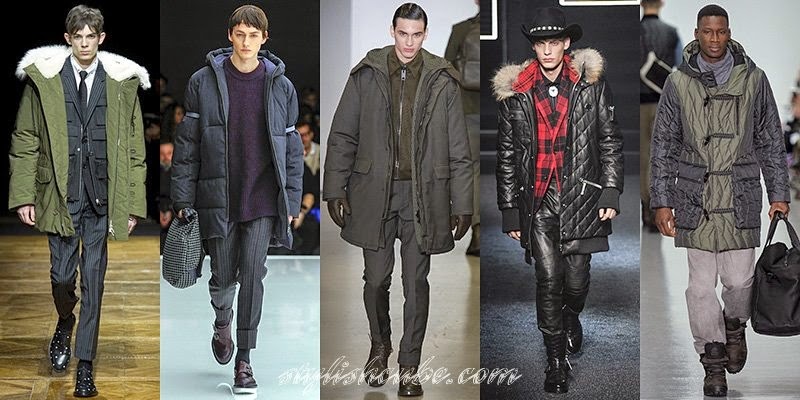 [Fall Winter 2014 -2015 Fashion Trends] - Comfortable and warm down-padded jacket – is a practical element of the wardrobe, with which designers love to work in recent years. In the new season down-padded jackets won heightened attention due to the volume and relief of quilting. 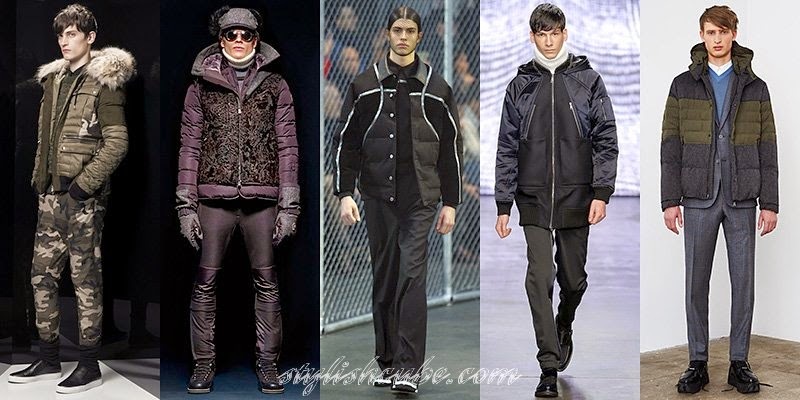 Collection of men's down-padded jackets 2015 allow you to pick the right model to any popular image of the season and even bring characteristic flavor or bright accent to it. Retro is in fashion and traditional down-padded jacket in the style of the 80s, in the same style as it was during its triumphant appearance, no doubt will be appropriate for our wardrobes. Familiar sporty silhouette with or without a hood has inspired many designers. Most short men down-padded jackets in retro style are up to the hip, but the models that are even shorter, to the waist, are acceptable. 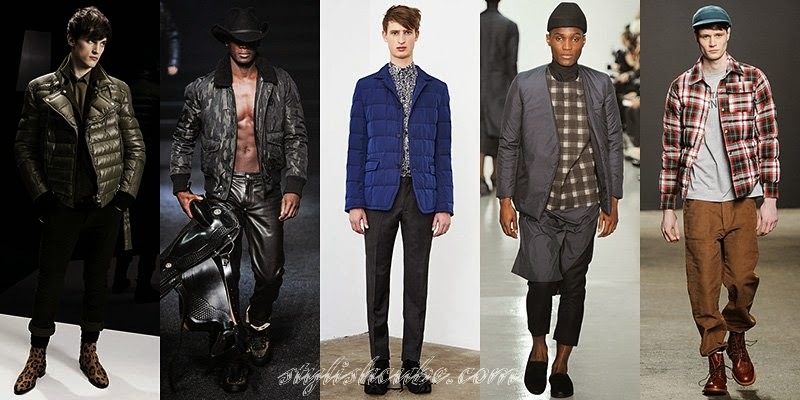 Trendy bomber jacket was in the first place among the styles of men's down-padded coats. It is concise, comfortable and versatile. Depending on the materials and colors, this jacket is able to match with classic trousers, sports and everyday models created as a result of an eclectic image with soft unobtrusive sporty note. 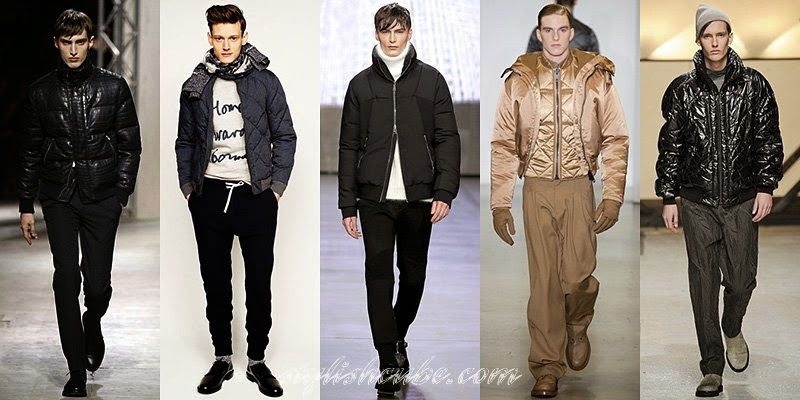 For short men down-padded jackets designers used the full range of possible styles, which appeared on the podium: from bombers with a collar and biker models with asymmetric zip to the down-padded coats in the form of jackets and shirts. Special attention should be paid to minimalistic men's jackets of a straight cut without collars and cuffs – which is a fresh and original version. Long jackets are also in vogue, direct working models with large patch pockets and a hood predominate among the styles. Wearing this down-padded jacket you will not freeze even in severe frosts, working style is currently ultra-popular, and material like leather or fabric with shimmering color and luster is able to convert essentially rough style of down-padded jacket in bright and unusual one. 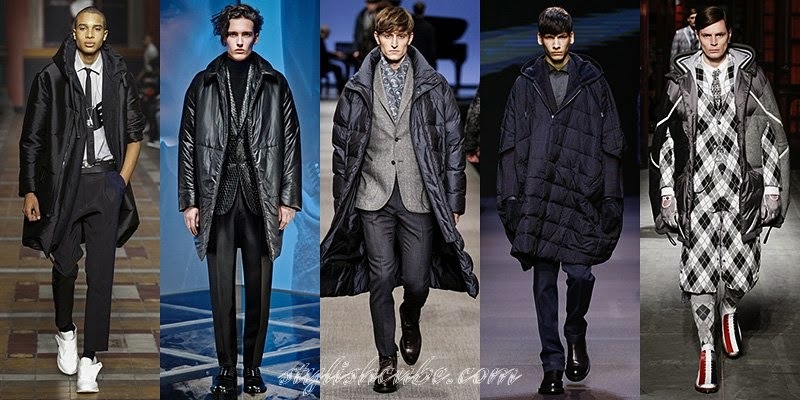 Due to the fashion on volume outerwear, not only down-padded jacket, but also a downy coats are out of competition. In addition, new collections of designers included a number of elegant models and original versions, for example, a variety of capes. 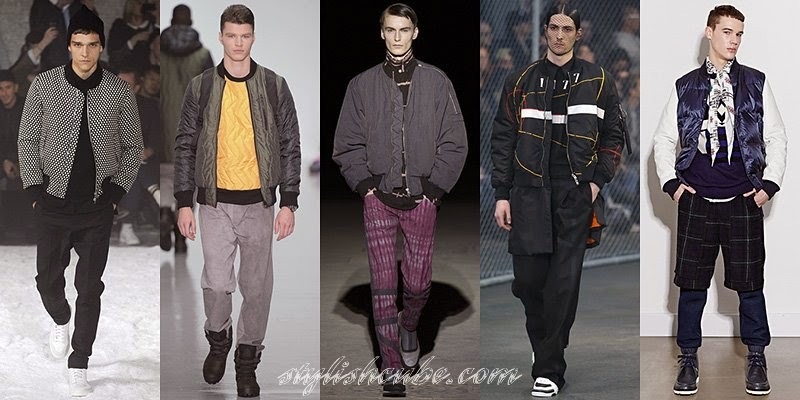 Multi-layering is in fashion, some men dow-padded jackets and coats of the season consist of two parts or imitate such a structure. Often there are two options: vests and undercoats. Generally, materials for them are selected of one or similar tone, but with a contrasting texture. 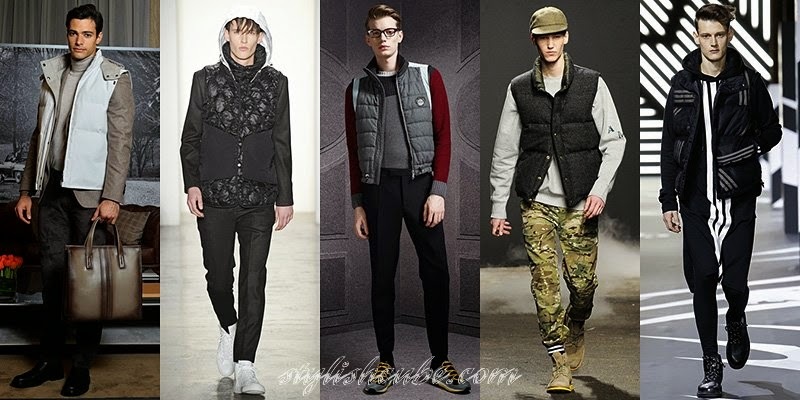 Down-padded vests as an independent element of the wardrobe remain on the trendy wave. Unlike women's collections, in the male one sport models dominate. Fancy jackets are less common, but are also relevant in the wardrobe of the new season as a stylish spice of a outfit. 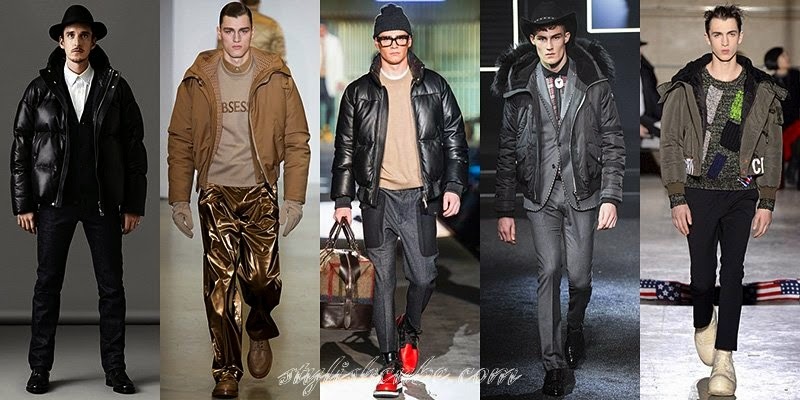 Except for matte and shiny fabrics for jackets, for down-padded jackets for men fashion designers choose a smooth, lacquer, leather of reptiles and its imitations, various textiles, from denim and wool to fabrics with shine. Of course, such materials go through protective impregnation – moisture is able to nullify the benefits of weightless and warm down-padded jacket. 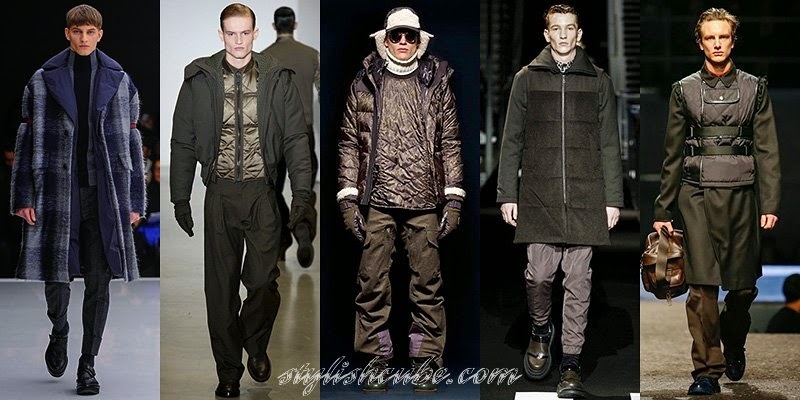 Popular trend of a combination of textures of materials is reflected in the collections of men's down-padded jackets. Designers combine together large parts of a cut with matte and glossy surface, fur and textile, jackets and woolen cloth. Many of these down-padded jackets simulate multilayer combination of a jacket and a waistcoat. 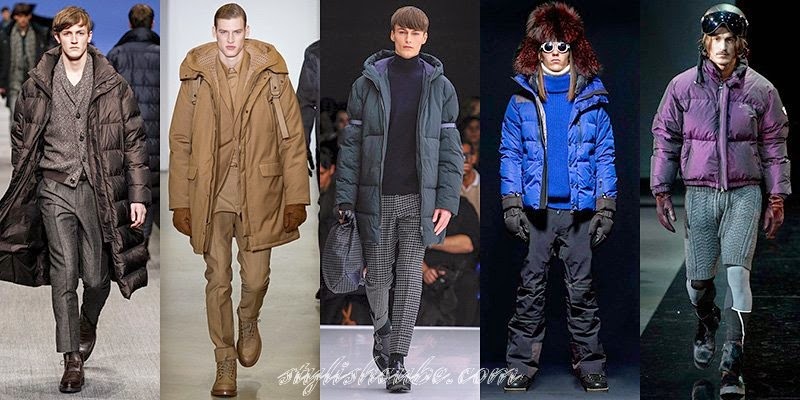 Black, shades of gray and caramel – are leading colors of the season for the men's down jackets in particular. Yellow jackets, bright and dark tones of blue, green, emerald, noble wine shades are also in vogue. Contrasting color combinations for male down-padded jackets are mainly selected for the upper and the inner material. 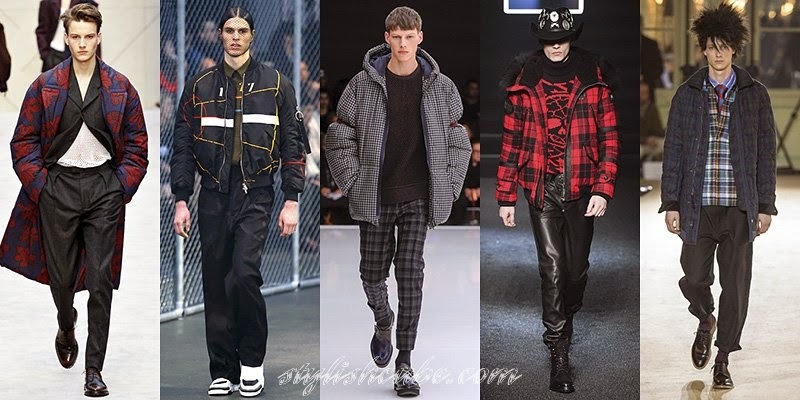 Down-padded jackets with prints – are trend models of the collections, the popular drawingsare: abstraction, monochrome images of plants, animals, and any check, from tartan and “Prince of Wales” to small or large “chess”.